It’s no coincidence that these overheated condemnations accompany abundant evidence that the Trump administration is finding its legs. As the last administration’s undeserved reputation as sober-minded foreign policy rationalists is dismantled one retrospective report at a time, its jilted members are lashing out. Rice takes a theatrically dim view of what is essentially a restatement of the bedrock principle of almost all international-relations theory: The international environment is anarchic. There is no “international community,” because there is no enforceable “international law.” To the extent that such a thing exists, it is dependent upon the willingness of nation states to subordinate their sovereignty to international institutions. There’s no mechanism to make them do this, save for the threat of force. The recognition that nation states exist in a state of perpetual competition is not some grim surrender to the darkest of human impulses. It is reality, the acknowledgment of which only conveys to other nations firm parameters in which they can operate without accidentally triggering a conflict with another sovereign power. Rice acknowledges that Moscow is a threat to regional stability and peace, “Western values,” and U.S. sovereignty. She implies that Trump is a menace because he declines to recognize that. In fact, it was Obama much more so than Trump who has failed to see the obvious. Barack Obama was inarguably the least Atlanticist president since the end of World War II. Within a year of Russia’s brazen invasion and dismemberment of the former Soviet Republic of Georgia, Obama scrapped George W. Bush-era agreements to move radar and missile interceptor installations to Central Europe. In 2013, the last of America’s armored combat units left Europe, ending a 69-year footprint on the Continent. By 2014, there were just two U.S. Army brigades stationed in Europe. The folly of this demobilization became abundantly clear when Vladimir Putin became the first Russian leader since Stalin to invade and annex territory in neighboring Ukraine. A year later, Putin intervened militarily in Syria, where U.S. forces were already operating, resulting in the most dangerous escalation of tensions between the two nuclear powers since the end of the Cold War. Putin’s move in Syria should not have come as a surprise; Barack Obama outsourced the resolution of the Syrian conflict to Moscow in 2013, if only to avoid making good on his self-set “red line” for intervention in that conflict despite the norm-shattering use of WMDs on civilians. 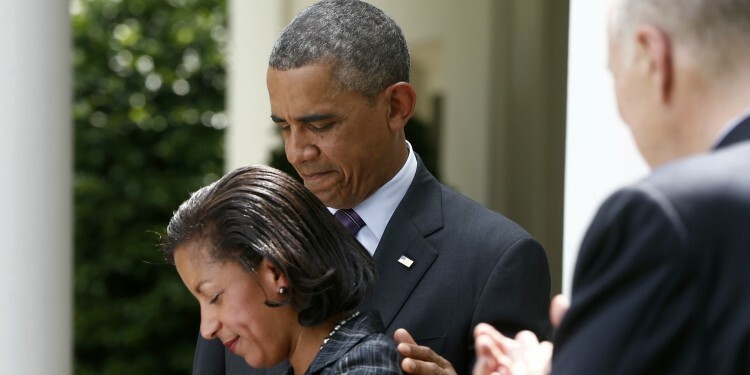 Even Rice’s chief complaint about Trump, his failure to condemn Putin’s brazen intervention in the 2016 election, didn’t elicit a reaction from Barack Obama until the final month of his presidency. By contrast, and to the surprise of just about everyone, the Trump administration has been tough on Russia. Trump has ordered harsh sanctions on Moscow’s Iranian allies for violating United Nations resolutions—a course the Obama administration declined to take even if it allowed Hezbollah terrorists with direct links to Putin to operate with impunity. He ordered long overdue airstrikes on Putin’s vassal regime in Syria, halting any further use of chemical weapons in the process. Trump not only declined to lift Obama-era sanctions on Moscow, as many feared he would, but expanded them. This administration closed Russian consulates and annexes in the United States. It has targeted Putin allies like Chechen strongman Ramzan Kadyrov under the Magnitsky Act—the same act that Kremlin cutout Natalia Veselnitskaya lobbied the Trump campaign to scuttle. Trump has even gone so far as to open U.S. arms sales to Ukraine, representing a significant blow to Putin’s ambitions in Europe. It is without a doubt that Trump now has a stronger record on Russia than Barack Obama ever did. No wonder Susan Rice is so angry. Rice further alleged that Trump recklessly accused China of being an “avowed opponent” of the U.S. rather than just a competitor, and then insisted that China has not “illegally occupied its neighbors.” Tell that to Brunei, Malaysia, the Philippines, Vietnam, or Taiwan, each of which lay claim to strategic territory in the South China Sea that the People’s Republic seized and turned into forward air and naval bases. Rice suggested that Trump’s “realists” decided to “lump” Beijing in with Moscow, not because it is a rising military and economic power, but because they wanted to “placate” American nationalists. Though this White House declined to defibrillate the Trans-Pacific Partnership free trade agreement back to life when it inherited its corpse, it has done a far more comprehensive job of working with Beijing to isolate Pyongyang than Obama did. As the North Korean nuclear crisis intensifies, China has backed fresh sanctions on North Korean financial institutions, cut off all access to Chinese iron, lead, and coal, and may even scale back petroleum deliveries to the Stalinist state by as much as 90 percent. And all in the space of one year. Rice bemoaned the fact that Trump’s national security document contained no nods to America’s core ideological principles, such as democracy promotion and human rights. Except it does. The strategy review did declare perfunctory fealty to the idea that America cannot “impose its values” on others, but it criticized nations like China and Russia for making their economies “less free and less fair” and for censoring information “to repress their societies.” It professed America’s intention to oppose “rival actors” who “use propaganda and other matters to discredit democracy.” The document added that this administration intends to “support the dignity of individuals” who “live under oppressive regimes and who seek freedom” and “rule of law.” The U.S. will use “every tool” to “isolate states and leaders who threaten our interests and whose actions run contrary to our values,” including “repressive regimes and human rights abusers.” After all, Dr. Rice, America values are universal values. Rice contended that the document failed to itemize the discrete identities on whose behalf the U.S. should labor: LGBT people, people in poverty, people with AIDS, people under 30, et cetera. Rather, the document insists that all mankind, regardless of conditions or accidents of birth, are objects of U.S. interest. Rice complained that climate change is no longer viewed as a threat to national security. Good. Climate change is not itself a threat to American national security but a threat multiplier, as the weather has always been. Save for some valid concerns about the prospect of an overly restrictive immigration policy and the precariousness of U.S. free-trade obligations, Rice painted a picture not of a radical administration but one that is returning to a familiar status quo ante. In nearly all respects, it was Obama’s White House, not Trump’s, that adopted an ideological foreign policy and rendered the U.S. and the world less safe as a result. Even as early as March of 2017, it was clear that the Obama administration’s foreign-policy professionals were quite insecure about how posterity would remember their stewardship of American interests abroad. They had every reason to be. For now, at least, the Trump administration has declined to govern as Trump campaigned; not as a populist firebrand but a conventional Republican. Susan Rice and her former White House colleagues have every reason to worry, but not for the United States. Their reputations, however, are another matter entirely.